In the ancient city of Hierapolis and during the Roman Empire, there were more than 15 baths around the area, that attracts thousands of people for health purposes. The current bath was formed by an earthquake that occurred in 7th century A.C. During the earthquake 1st century Ionian archways collapsed into the bath, giving the mystique setting to the water that still stands today. Because of its temperature, antique pool is effective in treatment of many diseases, as well as in relaxing. 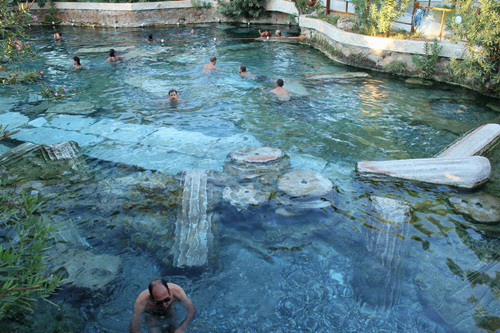 According to the researches done on the antique pool, the water is good for hearth and blood vessel diseases, arteriosclerosis, high blood pressure, rheumatism, skin, eyes, rickets and paralysis. These benefits explain why there were continuous health centers around the Antique Pool since the Roman Empire. Travertines are white rocks formed by precipitation caused by chemical reactions happened because of various environmental reasons. The geological events that formed Pamukkale's thermal sources affected a wide area around Denizli. 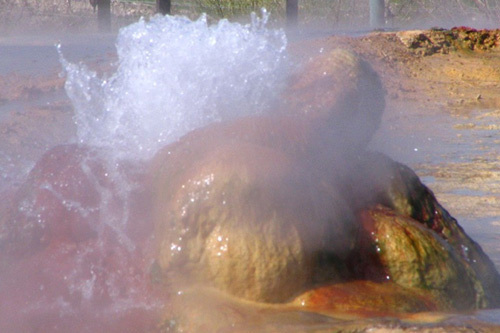 There are 17 hot water fields in the area, with temperatures ranging from 35C to 100C. Waters are being used for health purposes since the ancient times. After leaving the source, thermal water reaches to the travertines with a 320 meters canal, being poured into different levels of travertines and travels 300 meters in average. The water that comes at 35C from the source, which contains high amount of calcium hydro carbonate reacts to oxygen in the air. During the reaction, carbon dioxide and carbon monoxide gets separated from the water, leaving calcium carbonate to subside and form the travertines. When it collides, the residue is in the form a gel, that gets solid with time. Reaction's chemical formula can be described as: Ca(HCO 3) + O2 CaCO + CO2 + CO + H20. It is known that the white water in Pamukkale is good for joint pains and gynecological diseases, while the red water which contains high iron content is good for rheumatic diseases and some wounds. The blood circulation increases when a person switches between hot thermal water and cold water. Karahayıt is the only area that contains both white and red water. The iron in the water gives a red appearance to the smaller travertines in Karahayıt. 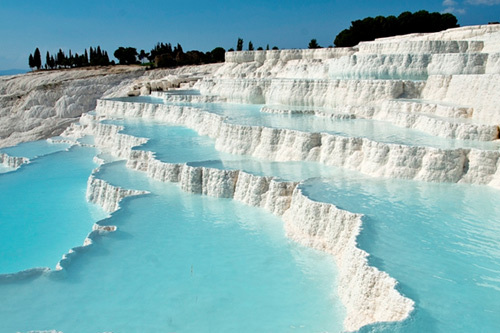 The water in Pamukkale is younger and contains less iron compare to Karahayıt's water, which is the reason why Pamukkale's travertines are white. Both waters contain calcium, magnesium, bicarbonate and minerals. Karahayıt's water comes hotter from the source. With its magnificent white travertines formed by water that comes from the nearby mountains and its Hellenistic/Early Christian city ruins, Hierapolis is one of the most striking historical attractions in the world. Located 2 km. away from the city of Denizli, the area is famous for its healing waters. It is believed that the ancient city is founded by II. Eumenes, the King of ancient Bergama civilization in the 2nd century B.C. 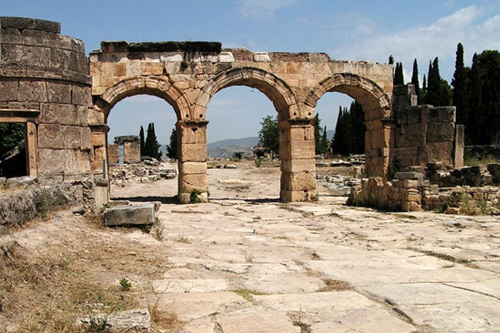 The name Hierapolis comes from Hiera, the wife of mythical founder of Bergama, Telephos. According to ancient records, the city was famous for its metal and stone embroidery and woven fabrics. The city became the capital of Phrygia during the reign of Great Constantine and it became the main eparch in Byzantium. Hierapolis is listed in the World Heritage List by UNESCO.